Hidden New Jersey: Duck! 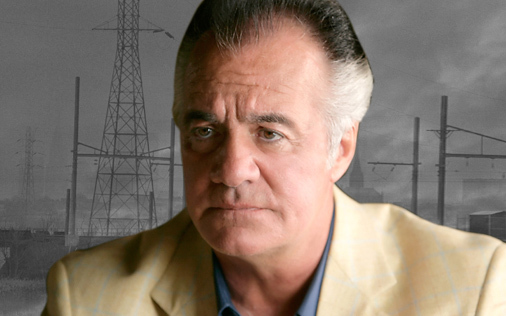 It's Paulie Walnuts! Waterfowl loom large on the New Jersey birder's mind in the winter. While we see mallards, geese and egrets most of the year, the state's lakes, ponds and shorefronts are now liberally flocked with gadwalls, pintails, grebes, coots, and others that generally only winter here. To the lesser-informed observer, some species look very much like other species, immature specimens of one may look like a mature member of another species, and females of one species look like males of another. It all gets a bit confusing, though others are so distinctive on their own that you can't help but remember them easily. Then there's the challenge of remembering the names. I usually count on mnemonics, or something about the bird that reminds me of something else. 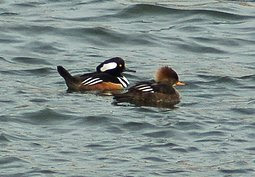 For instance, there's the Hooded Merganser. It's a perfectly nice duck and doesn't bother anyone. In my mind, though, it's represented by a sociopathic gangster: Paulie Gualtieri of the Sopranos. You know who I'm talking about. Good ol' Paulie Walnuts. Ivan laughs at some of my descriptions of birds, but this one is especially apt. When he's not puffing up his bouffant in mating season, the hooded merganser has those same back-swept white streaks in his head plumage that Paulie does. All the duck needs is a track suit, and they'd be virtually indistinguishable. Take a look and let me know if you disagree. Now, I've never known a hoodie to hurt anyone, or even make a remotely threatening move, but this comparison does give one pause. Next time we're in the Meadowlands, or the Pine Barrens for that matter, I'll have to pay special attention.